One of Scotland's most famous tartans ever, the Black Watch is a widely recognisable forest green and navy blue tartan. + One of Scotland's most famous tartans ever, the Black Watch tartan is proudly worn by civilians, pipe bands, the military, police, etc. The tartan was originally designed for the Black Watch Highland regiment. Known for its unique colour combination, the tartan's forest green and navy blue colours provided ideal camouflage in the field. + Quality 5 yard kilt, with a regular 62cm (24") drop, and deeply pleated traditionally to sett. + Made from 13oz acrylic woven tartan cloth, designed to hang, look and feel just like wool. + Two leather straps to fasten Kilt; Straps allow kilt to give or take roughly 10cm (4") either way on the stated size. + Finished with exterior belt loops and a 100% polyester blend waist interior lining. + Ideal for wearing on casual days in the countryside, family gatherings, festivals, sports events, or simply fashion wear. Take a measuring tape around your waist. The waist measurement should be taken about 2-4 cm (1-2 inches) above the navel (belly button). Stand straight, with your feet together, and don't look down. Take a firm but comfortable measurement. This will give you the Kilt waist measurement. Please measure also the length from your belly button to the centre of your kneecap. 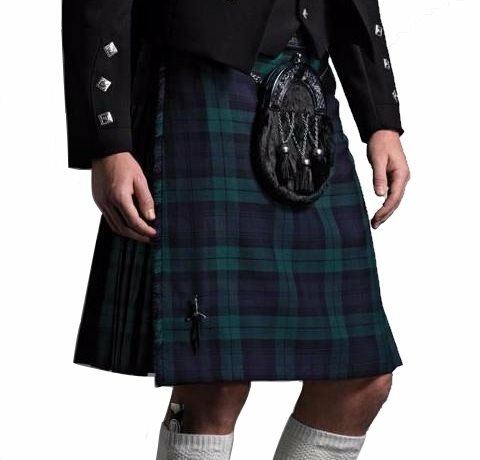 The standard drop of our kilts is 62cm (24'') and this fits most of our customers. Please get in touch if you need a shorter or longer length and we will do our best to custom make one for you.